For anyone who is lactose intolerant, has high cholesterol, needs to limit saturated fat, or is simply a dessert connoisseur, their sweet dreams have come true. Author Sharon Valencik demystifies the art of vegan baking so that everyone's culinary repertoire can now include delicious dairy-and egg- free desserts for all their celebrations. With over 50 million Americans experiencing some type of dairy intolerance, this collection of vegan cakes and other sweets will be welcomed by many. Over 130 recipes for decadent cakes, scrumptious cookies, creamy cheesecakes and pies, velvety mousses, puddings, and crèmes and other luscious treats are accompanied by mouth-watering photographs that provide inspiration and are a feast for the eyes. These desserts capture the same delicious flavors and textures of traditional favorites. But as a bonus, because they do not contain dairy or eggs, they are cholesterol-free, have little saturated fat, and leave a smaller ecological footprint. With up to 50 million Americans experiencing some type of dairy intolerance, this collection of vegan cakes and other sweets will be welcomed by many. Sharon Valencik comes from a lineage of creative chef matriarchs who taught her that food is an art and a creative process. When she became a vegan, Sharon transformed family recipes that had been passed down for a few generations into vegan versions that were exciting to the taste buds and spectacular to serve. She has been creating classic non-dairy desserts ever since. For the inexperienced baker and busy moms, these recipes are uncomplicated to make. Sharon's clear instructions and expert tips blended with everyday ingredients that can be found in a supermarket magically makes egg-less cakes rise, creates rich, creamy fillings without milk or cream, and cookies that have rich flavor and moist texture without the use of butter. 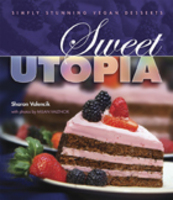 More information on vegan cooking can be found on Sharon's web site, sweetutopia.com. It's not necessary to be a vegetarian or vegan to enjoy these sweets. Omnivores of every persuasion will love the sensational tastes and appreciate the discovery of healthier dessert options. With the holidays almost here, it's convenient to have a collection of recipes that can both be a crowd-pleaser and cover individual dietary concerns (i.e. dairy sensitivities, egg-allergies, heart health, kosher diet) as well. Some of the recipes that will amaze guests and delight families include Midnight Cake with Chocolate Frosting, Ice Cream Cookie Sandwiches, Coconut Tiramisu, Mixed Berry Cheesecake, Gingerbread Guys, Chocolate Mousse, Lemon Berry Tart, Fudgy Chip Cookies, Cappuccino Custard, Pudding Parfaits, and Three-layer Cheesecake Bars. These are just a few of the endless possibilities of alternative desserts that can be made without animal products. Sweet Utopia guarantees sweet success. Media requests for a review copy can be sent to Anna Pope. For more information on a wide range of books on vegetarian and vegan cooking and nutrition visit Book Publishing Company's web site bookpubco.com.